Highlands NC home for sale, a must-see historic property on a large lot. In fact this fabulous property has three updated houses on it, making it ideal for a large family or gatherings. 81 South Old Walhalla Road is located on an 8.15 acre parcel of land just 2 miles from Downtown Highlands. The three homes offer great space for everyone, an idyllic vacation getaway. 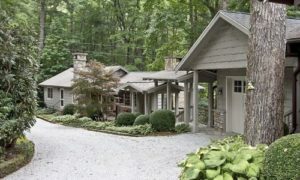 The main home on this Highlands NC property offers 5 bedrooms. In addition there is a one bedroom guest home and a 2 bedroom cabin. All three homes have been updated and offer great space to enjoy the peace and serenity of the property. Clear Creek runs through the property. Additionally there is a lake with a picnic pavilion and fabulous walking paths along the stream. The outdoor living space is fantastic, including a covered patio that is complete with an outdoor fireplace. There is also a fire pit that is ideal for s’mores and campfire stories. 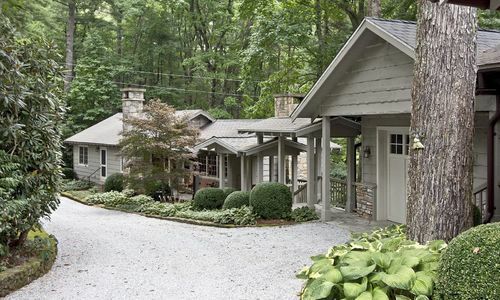 Beautiful natural gardens and stunning landscape design makes enjoying this Highlands NC property truly special. One unique feature is a kennel adjacent to the main house. While ideal for the devoted pet owner this area could also make a great art studio. Schedule a showing of this Highlands NC home for sale today! Contact our team at Berkshire Hathaway HomeServices Meadows Mountain Realty today to schedule a private showing of 81 South Old Walhalla Road. We welcome the opportunity to help you complete a successful Highlands NC property search. Let our knowledge and experience help you locate the ideal Highlands NC home for sale for you and your family.